Save 30% on Excalibur 5-Tray Electric Food Dehydrator — MumbleBee Inc MumbleBee Inc.
Deal of the Day: Save 30% on Excalibur 5-Tray Electric Food Dehydrator for 1/29/2019 only! Dehydration is the healthiest, easiest, and most economical way to preserve foods. Load the trays and set the temperature, the Excalibur dries the contents of all trays evenly so everything’s done at once. Dehydration concentrates the natural flavor, sweetness, and aromas of your food. Leaving you with a flavor that’s far healthier than high-fat snacks and high-sugar candies that are filled with chemical preservatives. Deal of the Day: $139.99 & FREE Shipping. 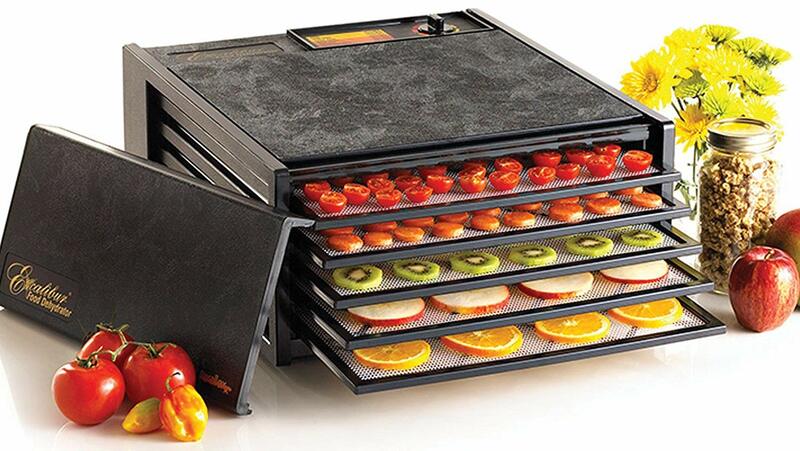 The Excalibur 5-Tray Small Garden dehydrator provides 8 square feet of drying space, and is perfect for families with small gardens. Includes flexible polyscreen tray inserts to prevent foods from sticking to trays, 5-Inch fan, built in on/off switch, and adjustable thermostat.